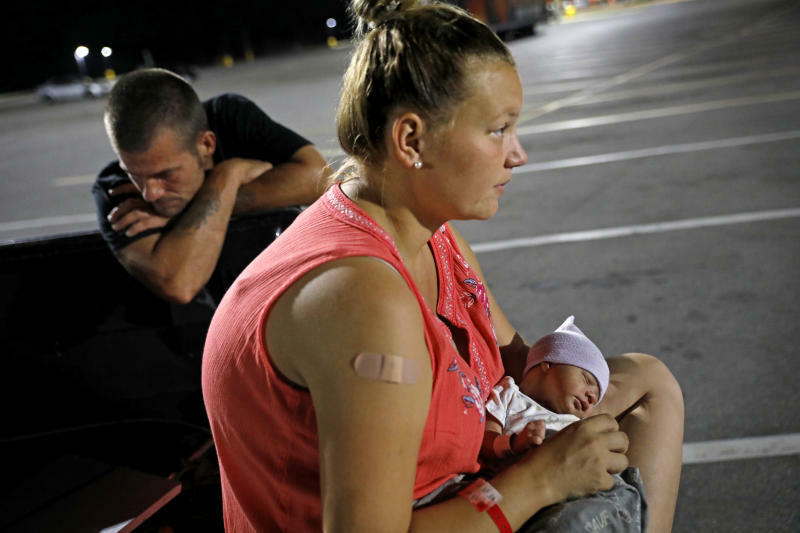 PANAMA CITY, Fla. (AP) -- Their home full of soggy furniture and mosquitoes, Wilmer Capps was desperate to find shelter for his wife and their son Luke, born just three days after Hurricane Michael ravaged the Florida Panhandle. So Capps, his wife Lorrainda Smith and little Luke settled in for the longest of nights in the best spot they could find: The parking lot of a Walmart store shut down by the storm. Police officers who showed up after the AP photographer escorted them back to Gulf Coast Regional, where workers checked out Luke but couldn't provide a bed for the night, frustrating Capps. Fearful of safety and sanitation problems at a shelter suggested by workers from the Federal Emergency Management Agency, the family returned to the Walmart lot.